Having exhausted myself of some of the major Greek yogurt purveyors, I've been led to start trying out other products by other manufacturers and that leads me to this Strawberry Greek Yogurt Parfait (yes, the third day in a row of strawberry flavored products) made by YoCrunch with REAL strawberries! 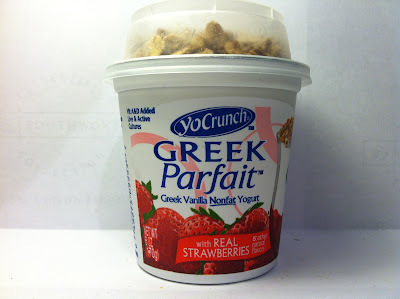 I have previously reviewed a regular yogurt parfait from YoCrunch, but as I've already mentioned, this is my first voyage into their Greek yogurt line. I picked this one up on sale at Marsh for $1.00 and it is six ounces of fun with 170 calories and eleven grams of protein. I mentioned in my initial YoCrunch review that their products reminded me of the choose your own adventure books that I read as a child since you can choose whether you want to add the granola to your yogurt parfait or not. Obviously, since it is included and this is called a parfait, you clearly should add it and I did after I took the picture above. That said, the parfait included the strawberry chunks (they are REAL, you know!) and "jam" on the bottom of the yogurt cup and I stirred that up to mix it with the thick vanilla yogurt so that you'd get a clear representation of what we were dealing with. As you can see, YoCrunch was not bashful with the strawberries in this parfait and I was impressed by their sizeable presence within the cup. In terms of the taste, the vanilla Greek yogurt in this was very mild and I would term it as "populist" since it lacked some of the bite that a lot of these Greek yogurts possess. It had a definite taste of vanilla, which was nice, but it really was sort of bland (again, going back to the populist angle). That said, the bland vanilla did mix well with the strawberries as they had a mild sweetness that brought a little additional kick to the mix, although not in a tart way but instead in a sweet way. 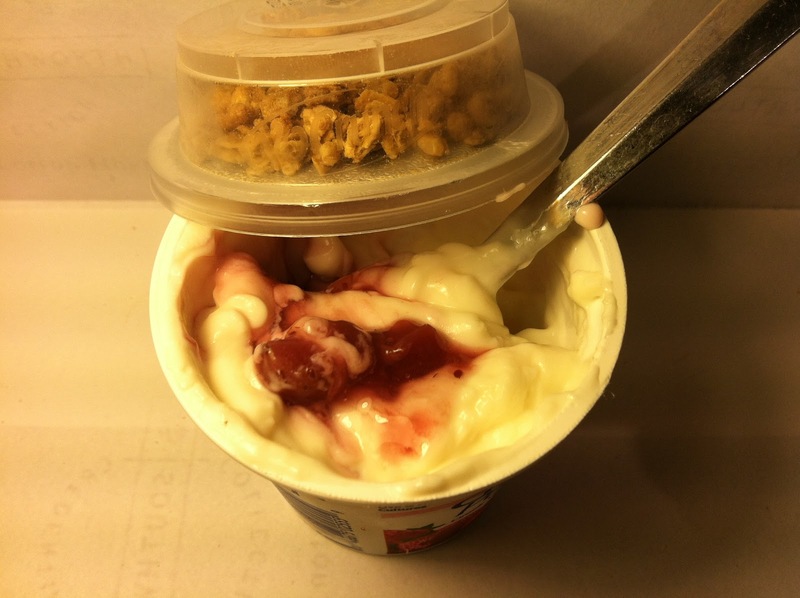 The granola, as you'd expect, added a nice crunchy texture to the yogurt to break up the softness of the strawberries and the not overly creamy Greek yogurt. While the individual components of this may have been sort of plain, all of these ingredients worked well together to provide a solid total package. Buy It or Fly By It? I would say BUY IT on this. While this was not a particularly outstanding treat, it was a very solid effort and well done by YoCrunch. After my disappointment with the parfait with their regular yogurt, I did not have high expectations for this, but thankfully, my expectations were far exceeded as I enjoyed spoonful after spoonful of this delightful parfait.